Recently I was involved in a thread at a Q&A forum that discussed how to populate a DataGridView. On its face this seems to be an easy operation, i.e. acquire the data from the Database and in the next step add the data to the DataGridView Control. As with most things; if we have the necessary knowledge then it’s easy to achieve the task and if not it would be difficult. The key aspect in this context is to be aware of that a DataSet can include one or more tables. Therefore we need to explicit state in the code which table to display. 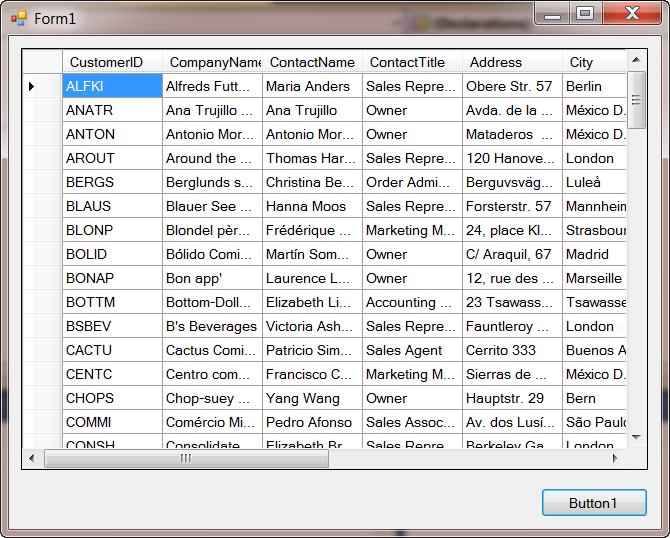 Const SQLExpression As String = "SELECT * FROM Customers;"
'Here we control which table the DataGridView should display. As we all know by now, the Office 2010 comes also in an x64 version. That force us to consider if the above solution also will work with Excel 2010 x64 or not. With the release of Office 2010 we also got the x64 ACE OLEDB Provider. If You cannot find it on Your x64 set up then You can download it from the Microsoft Access Database Engine 2010 Redistributable x64. I thought that I should notify readers of my blog that Microsoft recently has launched a new Excel Developer Center on MSDN. I find it really nice to see, for instance, VBA and VSTO on the same page. Don’t miss the presentation of Excel Developer RoadMap.